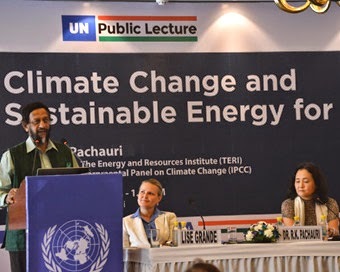 “While India has made major progress in the supply of electricity and modern forms of energy, a large part of the population still lives in a state of energy deprivation,” said Dr. R.K. Pachauri, Director-General, The Energy and -Resources Institute (TERI) and Chairman of the Intergovernmental Panel on Climate Change (IPCC). As the latest IPCC report notes, India's high vulnerability and exposure to climate change will slow its economic growth, impact health and development, make poverty reduction more difficult and erode food security. “Energy has to be accessible, available and affordable for all people, most importantly poor people. There also has to be accountability in the system so that people know their needs are being met and can do something about it if they're not. A key challenge for India is making sure that all four of these "A"s are present for all people,” said Lise Grande, United Nations Resident Coordinator.